Beach running to lose weight has a magical connotation to it. Yes, it is possible to lose fat by running on the Florida beach, but there is something even more important. In order to lose unsightly fat, you must take care of your nutrition first. By this, I mean, you must adopt a lifestyle of clean eating...which means getting sugar foods and grains/processed carbohydrates completely out of your diet. There is a new saying..."You can't outrun your fork." It speaks directly to the fitness myth that was started right before the running explosion of the 1980's. During that decade, interest in 10K races, half-marathons, and full blown 26.2-mile marathons reached critical mass. "Carb-loading" was the latest buzzword, and even my Physiology Of Exercise professor at the University of Oregon told our class that you can eat anything you want if you just run 5 miles per day. Sadly, that was not the case. It may have worked for elite racers who trained with Olympic intensity, but all it did for the American public was make them a bunch of fat joggers...and increased the odds of contracting Type II diabetes. So, yes, beach running to lose weight is a great strategy...but it has to be done with some common sense. I will be the first to tell you that running on the Florida beach is pretty much like running in Paradise. The scenery is beautiful, it is low-impact, and you get a lungful of clean, salt air with each breath. I'll also tell you that you can lose an incredible amount of fat, and become very lean-looking with beach runs. HOWEVER, you must combine a quality nutritional lifestyle if you are to see any lasting results. Without taking your nutrition seriously, you will just be spinning your wheels. Sure, you can lose weight with simply running on the beach, but when you made a lifestyle change to eat more cleanly, you will incinerate fat. Actually, the "best diet" to lose fat is not a diet at all, it is a complete lifestyle change to eating natural foods. Since about 2012, the Paleo/Primal/Natural Food lifestyle has come to the forefront, and with good reason...IT WORKS. When you get sugar foods, grains (especially wheat and corn), processed high-carb foods, and industrial vegetable oils out of your diet, you will lose fat. You do NOT have to count calories, you do NOT have to be restrict your foods. All the foods you eat come ONLY from Mother Nature. They come off trees, they come out of the ground, and they are either fish, poultry, beef, pork, or lamb. To get a better understanding, you can read The Wild Diet, by Abel James or The New Primal Blueprint by Mark Sisson. Please do not limit your thinking to just running hard. Your training is only about 15% of fat loss. The remaining 85% hinges directly on your your nutritional choices. Before you start a program of running on the beach, put in a little time gathering information and doing some planning. You will not be losing much fat if you are laid up with a nagging injury that could have been prevented. Start slowly. Vary your workouts (include some walks!) Vary your speed and distance. You can do this intuitively or follow a plan by an intelligent athlete/writer, like Olympian Jeff Galloway. Sure, you can lose fat by pushing yourself through a 10K each morning, but you will eventually get injured or burnout mentally. I have long days (6 miles) short days (2-3 miles), interval days (where I run 8-10 400m segments faster than race-pace with a few minutes of walking between each interval) and some sprint days of 40m - 60m. Everyday is different. If I do not feel recovered from the previous day, I walk for an hour. Running on the beach is a dream come true. Losing belly fat and creating a lean, taut body is even better. However, there are some important things to keep in mind. * First, before you start any new diet or exercise program, CONSULT WITH YOUR DOCTOR! Give them the specifics of what you want to do, and go through whatever tests they want you to take. * Get a pair of good comfortable running shoes...but know they are going to get wet, sandy, weathered. Plan on spending over $100 for quality shoes. Many runners, here on the Florida beaches, run in Vibram training shoes. * Hydrate. Running on the beach can be warm and muggy. Drink as much water as needed. Drink before your run, and plan on stopping at places along the way to rehydrate. * Continually be on the lookout for anything in your running path. Fish hooks and broken beer bottles are no fun to deal with. *Run at low-tide whenever possible. Running in the soft sand at high-tide puts a tremendous amount of stress on the muscles in your lower legs and feet. Running on the beach to lose belly fat is a wonderful way to reach your weight loss goals. You do not have to go fast. You just need to be consistent and combine it with eating quality, natural foods. Do Not Live Near A Beach? Just because you do not live near a beach, or you have a condition that prevents you from running, doesn't mean you cannot get rid of unhealthy and unwanted body fat. Please checkout the short video below for a simple, but tremendously effective program for fat loss. The author of this program is St Petersburg FL resident and elite personal trainer, Elliott Hulse. His Strength Camp in south St Pete has helped thousands of everyday people accomplish their fat loss goals. Elliott is a bit earthy in his presentation, but it does nothing to diminish the exceptionally simple and practical advice he provides for lifetime fat loss. I wish you the best as you pursue your goals to enhance your health, and create the an entirely new body. 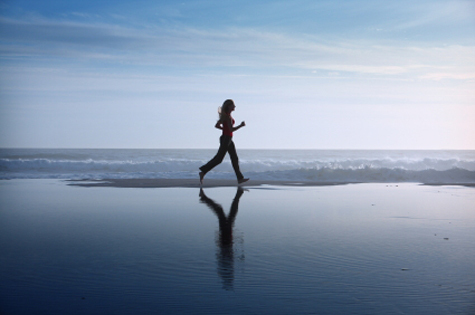 Beach running to lose weight is just one of the tools available to you.